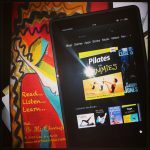 I picked up Pilates for Dummies on my Kindle. Because…. well… you know. Notice my very cool kindle sleeve underneath my Kindle FIre? They are also available for iPads. You can get my kindle sleeve here. There are also Kindle covers that open and close like books. Keep those in mind and peruse the boutique for links! Register to receive these posts once a week by email and get my eBook “Ahhhhh…Haaaaaa Moments with Ms. Cheevious” for FREE as a result. Registration is on the right side bar of every blog post, or on our Facebook page. See you next time. Blog content copyright 2013, LISA JEY DAVIS a.k.a. Ms. Cheevious.